Unknown Worlds issue #7 from the 'my comicshop' website. So last night I watched the classic Conan film from '82 & then moved on to 'The Golden Voyage of Sinbad'. This film has so many classic old school Dungeons & Dragons elements in it & Prince Koura (Tom Baker) might as well have been the poster boy for so many black wizards that my PC's have faced over the years. In Worlds Unknown 7 & 8. These two issues adapt the film “The Golden Voyage of Sinbad” & they're very well done. I've had these two comics through fire,flood,ex girl friends, & the demons of darkness knows what else. "Marvel Comics published a two-issue adaptation in Worlds Unknown #7–8 (June & Aug. 1974). 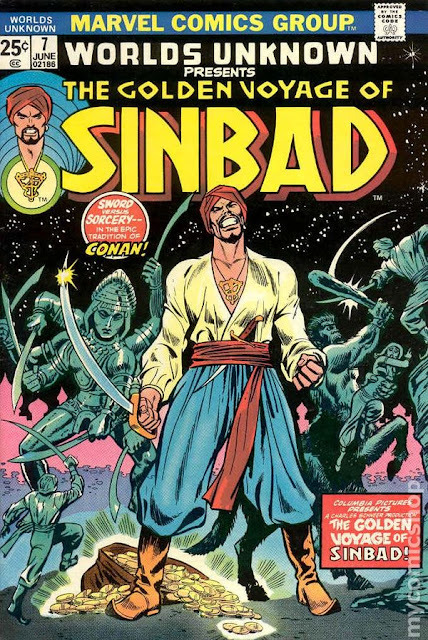 Titled The Golden Voyage of Sinbad: Land Of The Lost, it was scripted by Len Wein, penciled by George Tuska and inked by Vince Colletta." Sure they're not worth a lot but they have meaning for me beyond the mere cover price. 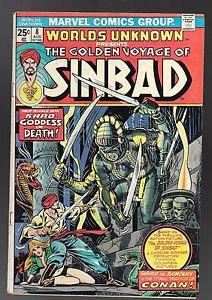 Marvel's version of Sinbad was proper Sword & Sorcery in many respects & appeared in various D&D games as a reference. What a lot of folks don't realize is that the film & comic adaptations present some classic 'how to do a dungeon' elements especially for a Sword & Sorcery campaign. One of Sinbad's first mates states right off the top that this Lumeria is one of the island remains still sticking out of the sea. Shades of Clark Ashton Smith's Atlantis? If Smith's Poseidonis is "the last isle of foundering Atlantis" then this remain of Lemuria has grown corrupt with its own magick. Yet its still trying to influence the world of Sinbad's 8th century. The statue of that goddess isn't even necessarily Kali but like the Romans adapting local gods & goddesses to suit their needs. This is a corrupted Lemuria version of the classic goddess look how easily Prince Koura animated it. Sure he paid the price for his black magick but he was a menace beyond most sanity. That was the thing with the Unknown Worlds comic book it had top quality fare but the public was more interested in Star Wars then science fiction or Sword & Sorcery. The Seventies were a funny time & golden age for comic books & comic book style magazines. This phenomenon would of course reach its height in the black & white crash of the Eighties. "Marvel Comics' science-fiction anthology Worlds Unknown ran eight issues, cover-dated May 1973 to August 1974. 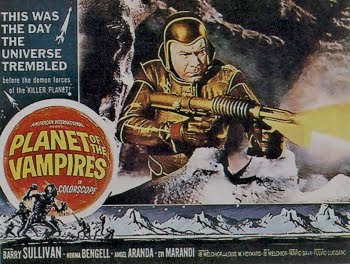 The title was one of four launched by Marvel Comics editor-in-chief Roy Thomas to form a line of science fiction and horror anthologies with more thematic cohesiveness than the company's earlier attempts that decade, which had included such series as Chamber of Darkness and Tower of Shadows. 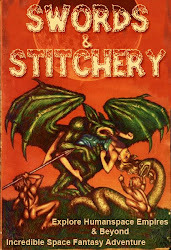 Whereas those titles generally presented original stories, these new books would instead adapt genre classics and other works." There's more here as well with the Clark Ashton style survival beyond its appointed time theme happening with the film's Lemurian descendant natives especially the God of the Single Eye and the Fountain's Guardian of Evil. The degenerate centaur & griffon are all that remains of the legacy of Lemuria in the film yet the natives maintain the dungeon out of religious tradition or a touch of destiny. Again there's a sense of CAS's Poseidonis about the Lumurian survival sticking up out of the ocean waters after all these centuries. Do the peoples living around the island think of themselves as Lumurians just as CAS's cycle of stories suggest about Atlantis? 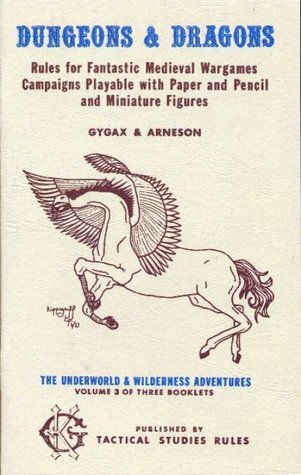 This pattern of dungeon location design that we see in the Golden Voyage of Sinbad is very similar to the ideas laid down in Dungeons & Dragons Vol. 3: Underworld & Wilderness Adventures. This idea of native cultures & cults being centered on the dungeon location as both a place of worship & ancestral occult power is pervasive throughout Appendix N literature. Just like in the first Raiders of the Lost Ark film's Hovito people's temple which is another 'lost world' remnant that's turned into a trap laden dungeon as well as a temple of occult power. The Lumurian survival island is a clear anchor of the once powerful supernatural legacy of the gods of this place. But its become corrupt, powerfully unbalanced, & could actually be a very real danger to those around it. This is exactly the sort of location well on its way to being a sink of evil ala Adventurer, Conqueror, King given few more centuries. Of course in two strokes the Grand Vizier takes on not simply one crown but two. Think about it, he's taken on the island kingdom as well. This isn't evident but he's a very wise man to out flank Prince Koura with Sinbad's help but is he about to leave that little island sitting out there? Who knows what other little Lumurian treasures are waiting for adventurers to stumble upon them?! Would your party leave such an adventure location?